The Employee Letter of Commendation is sent to an employee to commend them for something well done. This Employee Letter of Commendation is included in editable Word format that can be customized in Word or by using the included Wizard software. How do you write a Employee Letter of Commendation document? Subject: Commendation for First Last. I'm writing this letter to recognize and commend First Last for insert good deeds/work/habits, etc. -whatever person is commended for. Provide further details of commendation as desired. Letters of commendation may be sent to prospective clients and employers, current supervisors or committees (such as those that name "Employee of the Week" or "Teacher of the Year") or even to the person being commended. To make this into a recommendation letter, conclude with the recommendation (such as to hire or reward the person being commended). 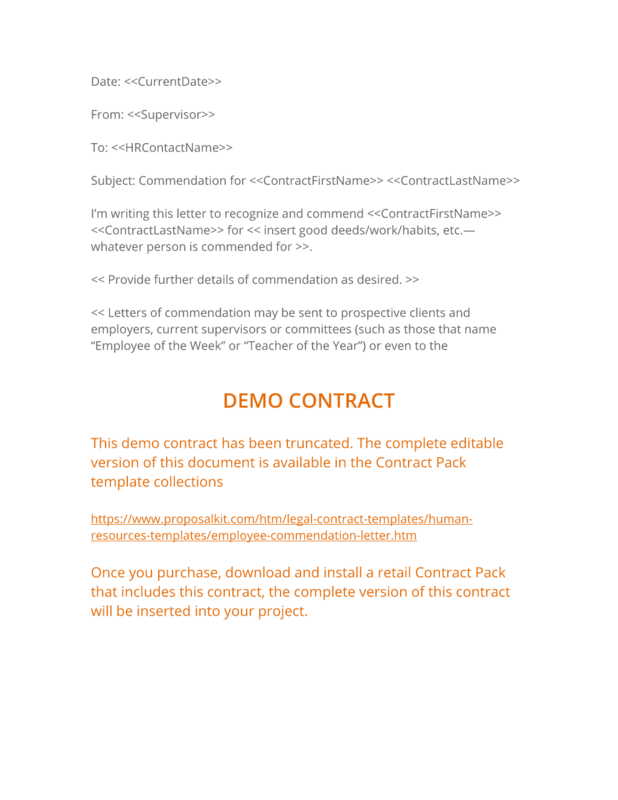 The complete Employee Letter of Commendation - with the actual formatting and layout - is available in this Contract Pack.